Sophomore Chris Paton (Glasgow, Scotland/Uddingston Grammar School), freshman Len Heinson (Wupperal, Germany/Carl-Fuhlrott Gymnasium) and senior Andrew Palumbo (Fort Myers, Fla./Darton College) each scored their first career goal as a Huskie to lead the NIU men’s soccer team to a 3-0 victory over Quinnipiac on Sunday afternoon in the Lakeside Classic. “On the whole I thought it was a very comprehensive performance,” said NIU head coach Eric Luzzi. “We played well on both sides of the ball; we had a clean sheet, which is a big deal for us. They had a couple of chances, but we limited their chances for the most part, and we finished three chances and had two or three other very good ones. NIU (1-0-1) nearly scored the opening goal in the 10th minute as a shot from junior Charlie Oliver (Crystal Lake, Ill./Crystal Lake South) was saved off the line. Sophomore Derek Ott (Cross Plains, Wis./Middleton) played a ball to sophomore Albert Levett (Southend-on-Sea, England/Belfairs High) inside the box, Levett played the ball across to Oliver at the back post, his shot beat Quinnipiac goalkeeper Borja Angoitia but was cleared off the line by Stevenson Hawkey. Quinnipiac (0-2) had an excellent opportunity to go in front in the 21st minute from Raphael Carvalho. A through ball split the NIU centerbacks and found Carvalho who was in alone on junior goalkeeper Andrew Glaeser (Walla Walla, Wash./Oregon State) but pulled his shot wide of the post to Glaeser’s right. Paton put the Huskies in front in the 29th minute off a corner. Levett played the initial ball in from the corner that senior Dusty Page (Germantown, Wis./Kettle Moraine Lutheran) rose highest to head toward goal. Angoitia palmed away the initial header before Paton followed up with a shot into the roof of the net to put the Huskies in front. In the 40th minute, NIU had an excellent opportunity to double its advantage as Palumbo played the ball down the wing to Ott who played the ball into the path of senior Isaac Kannah (Plymouth, Minn./Prairie Seeds Academy). Kannah fired a shot back across the face of Angoitia who just got a toe on it while diving in the opposite direction. Three minutes later, Glaeser was called into action on a shot by Machel Baker that was well held by the Huskie goalkeeper. After the intermission, NIU found a second goal through Heinson in the 56th minute. Freshman Alex Saliba (Rhode-St-Genese, Belgium/European School of Brussels 1) won the ball in his own half of the field and played it ahead to Paton who made a nice turn around a Bobcat defender. Paton they played the ball into the path of Heinson who whistled a shot past Angoitia from 16 yards. Heinson had another chance three minutes later but his shot from down the left side went high and wide. 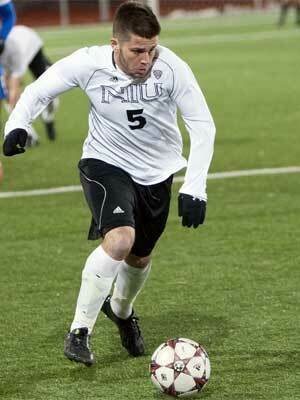 NIU put the game out of reach in the 80th minute as Palumbo converted a penalty kick. The senior from Fort Myers, Fla., collected a ball played out by the back and showed strength to work around a Quinnipiac defender before being pulled down just inside the box. Palumbo stepped up and took the penalty himself, slotting the shot under Angoitia to give the Huskies a 3-0 lead. Glaeser made a pair of saves en route to his second consecutive shutout to begin the season. The Huskies will return to action next weekend when they travel to California for a pair of games. NIU will play at Cal Poly on Friday, Sept. 5, before traveling Sunday, Sept. 7, to Santa Clara. 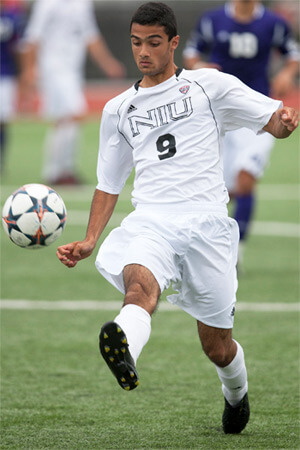 For more information on NIU men’s soccer and Huskie athletics, visit www.niuhuskies.com.